Racers. Do you worry about oiling issues, or do you just drive? I'm in two minds about how to approach this. From time to time I get sucked in by the black hole on the Internet that goes on about oiling issues and imminent engine implosion. And despite my efforts to improve the oil supply I feel I own a ticking time bomb and want to get rid of it. Often times, however, I figure I should just stop worrying, do the regular service, drive as hard as I can on track and trust that things will most likely hold up for a long time as long as I take care of them. 1 Do you active racers often experience engine failueres? 2. Do you active racers often see other racers who have engine failueres? 3. Do you active racers constantly fear engine failueres, and does it influence the way you enjoy the car? Last edited by Bebbetufs; 10-17-2017 at 10:26 PM. Reason: Unclear questions need clarification. From time to time I get sucked in by the black hole on the Internet that goes on about oiling issues and imminent engine implosion. And feel I should address this in some way or another. What is your experience and approach? I'm a firm believer in that you make you own luck I will do the things that give me peace of mind (within reason and budget), and for the rest, just enjoy! Obviously, I would do the IMS bearing upgrade first, but M96-97 engines have some pretty serious issues with engine oil starvation if you push them hard... start with the right oil, oil quantity, oil filter, oil sump baffles, maybe a deep sump and an Accusump. There are other more expensive things you can do like dual scavenge pumps, and even a dry sump upgrade (if you have the money or skills). Oil pressure and temperature gauges will help some, but a real data logger would be best since your focus on the track should be outside not inside. It all depends on your driving skill level, what you want to do with your car (track only or track/daily driver), and off course your budget. I use a 2 qt deep sump with horizontal baffle combined with a X51 style vertical baffle. I guess my question was unclear. I'm sorry! I've been reading all about this for years. Original dual row IMS inspected and in great shape. Internet is a dificult place to find objective information, and few of us are willing to do destructive testing, or have the datalogs needed to find out if our mods work or not. All my mods are based on the best knowledge available at the time, but cruisually not backed up by actual data on oil pressures during a race, at least not data made available to the public. Oil pressure drops seem to be a problem. I was planning to add an accusump to the system, but since the only data I'v seen says it doesn't help I've decided to drop it. What I'm getting at is this: As almost none of you have dry sumps and you are still racing: If they constantly blow up there would be no racing. How frequent are actual engine blow ups during races? Do you worry that the engine is weak and will blow, and does it hold you back from enjoying the car and going for it in races and during practice? Or is this actually as solid an engine as other street engines tthat are raced? Last edited by Bebbetufs; 10-17-2017 at 10:32 PM. Thanks for your detailed reply. Do you have any datalogs you might share? I will be running a datalogger, but I have no logs yet. I want to keep driving as hard as I can on the best suspension and tyres I can afford. It is a stripped, fully caged race car build. I'm also allowed aero changes such as a real splitter and rear wing. Last edited by Bebbetufs; 10-17-2017 at 10:19 PM. Looks very nice and extremely similar to my setup. Have you done any datalogging of oil pressure with this installed? I run my 2002 in track days, and use street tires to keep the g-loads low because of the oiling problems. I also have a sandwich plate which lowers the sump, along with the plate to also lower the oil pickup. While I had it apart, I went ahead and installed the X51 baffle as well. No, I have not done any data logging. Nice! Sounds like yours is holding up fine. How many track days per year? Would you say that fear of an engine failure is the main reason you avoid running at a higher speed potential (sticky tires)? Or are there other considerations you consider important? Last edited by Bebbetufs; 10-18-2017 at 06:35 AM. OK. Thanks for replying. How many track hours have you done with it? I've done about 10h. with my similar sump but temps are likely much cooler here. from what i can glean, engines fail from extended g-force in one direction (depending on the car - different in rear vs mid-engined applications?). g-force due to sticky tires and/or long/banked turns. it is not a pick-up, oil capacity or foaming problem, otherwise updated pickups, extended sumps, baffles, and accusumps would address. it appears to be an oil pooling in the heads problem. indirect evidence? x51 and subsequent generation engines add additional head scavenge pumps. now, the oil pooling in the head reduces available oil, however as noted, increasing oil capacity doesn't solve the problem, so the issue is that the oil doesn't move once in the head in these high-g conditions, so doesn't cool and eventually breaks down and something fails. so, there are additional scavenge pumps you can add (TTP sells a kit) or you can get a dry sump kit. 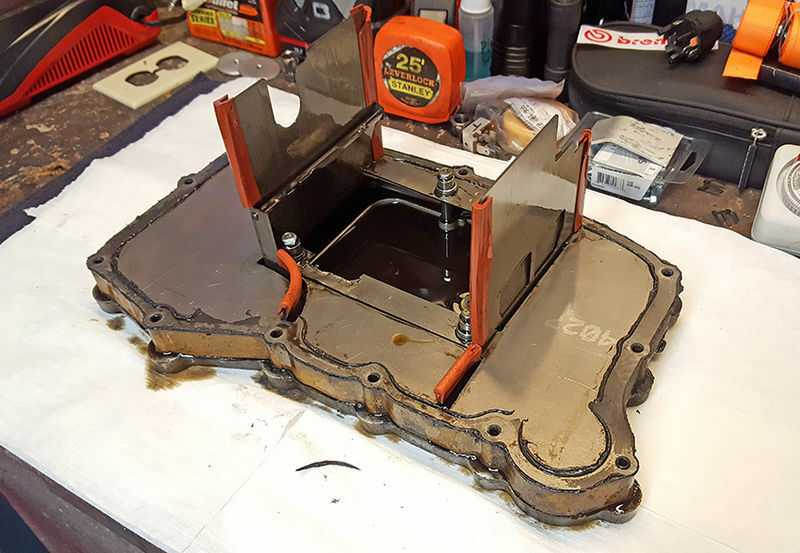 the benefits of the dry sump noted below are not the increased capacity or the increased defoaming, but rather that the external scavenge pump draws from the heads as well as the sump. you note that an aos is not required with his kit - this is because *i think* he is using the aos vents on the heads to scavenge from (and also starts you down the thought path of how oil pooling in the heads is also tied to aos failures on the track ...). i have a further sneaking suspicion, however. jake raby notes that his is not that impressed with the x51 heads, which leads me do believe that the additional scavenging in the heads is not the silver bullet. also noting that oiling failures do not all occur in the heads; they are also seen in the bottom end. what i am thinking is that oil pooling in the heads is creating sufficient back-pressure to trigger the spring-loaded pressure relief valve in the oil pump and, as a result, inhibiting oiling throughout the engine in extended high-g situations. my question would be if anyone has put a different spring in that thing - how does oil pressure behave at the track? ps, this doesn't answer your question at all, but the thread got me thinking out loud so to speak. I am back to running my oil level 1 bar down from full on the digital gauge (I used to run down around 1/2 to 1/3 from the bottom bar). I haven't been having any AOS trouble but that may be track dependent. I feel pretty good with this setup, running on 100 TW r-comps like Nitto NT-01 or Maxxis RC-1 and 200TW tires like Hankook R-S3. I don't have any data logging but I do have a camera setup that captures the oil gauges so it is like a "poor-man's" data logging. The 10W50 (I am running Miller$ nano 10W50) - the 50 part helps and yields better results and less dips than the 5W40 especially when hot - Mobil 1 5W50 is an alternative an on the Porsche approved list or Amsoil 15W50. I like the Millers because I can get 5000+ miles on each fill (mostly HPDE and to/from the track driving) and still get a good UOA with plenty of TBN left. The longer life helps mitigate the cost for me. I still get dips in places, but they are not severe and my UOA are good and not showing any abnormal wear, so I am feeling pretty good. Ultimately I would like to go dry sump, but it is $$$. Cheaper than a 996TT though or an air cooled dry sump 911. And I really like the Boxster platform. Future potential reliability mods - replace the OEM rad fans with SPAL fans to see if I can keep things a little cooler, maybe combined with new radiators. Could you point us tho the data? Nice info people. Keep it coming. Please read the thread as I don't want to quote too much of his work. However, here are some key findings. I didn't test it completely, but the X51 sump seemed to perform MUCH WORSE than stock. Accusumps don't address the problem at all, although they can be helpful in very extreme circumstances. Dual scavenge pumps on the cylinder heads do nothing to address the problem. The problem gets worse as oil/coolant temperature goes up. The problem in 2.5 liter engines is less severe than in larger engines. A 2.7 is much worse than a 2.5, and I expect (but have not tested) that the 3.2 + engines are worse yet. The severity of the problem is not very dependent on the speed of the car or driver. I have data showing that a driver going 5 seconds a lap slower than another driver in the same car, in the same race, with the same temperatures, does not significantly reduce the risk of bearing failure. Last edited by Bebbetufs; 10-18-2017 at 11:11 AM. 2. LN ceramic IMS bearing. 3. LN 1/2 Qt Deep Sump. with X51 stainless baffle. 6. Accusump. 2 Qt. with remote filter. 8. Air to Oil cooler fan cooled. 9. Electric power steering pump. 10. Manual engine Bay Fan switch. Last edited by AZ986S; 10-18-2017 at 07:50 PM. Hey Jsceash, did you notice coolant and/or oil temps lower after you installed the 997 cooler? I did five track days last year, but only one this year. There are two reasons I haven't gone to R-compound tires - I wanted to avoid the oil starvation trouble, and the cost. I'd have to get another set of wheels + the cost of the tires themselves. What track do you run at in Norway?